I've always dreamed of creating my own dressing room, a place to house the garments, shoes and handbags that inspire my love for fashion. 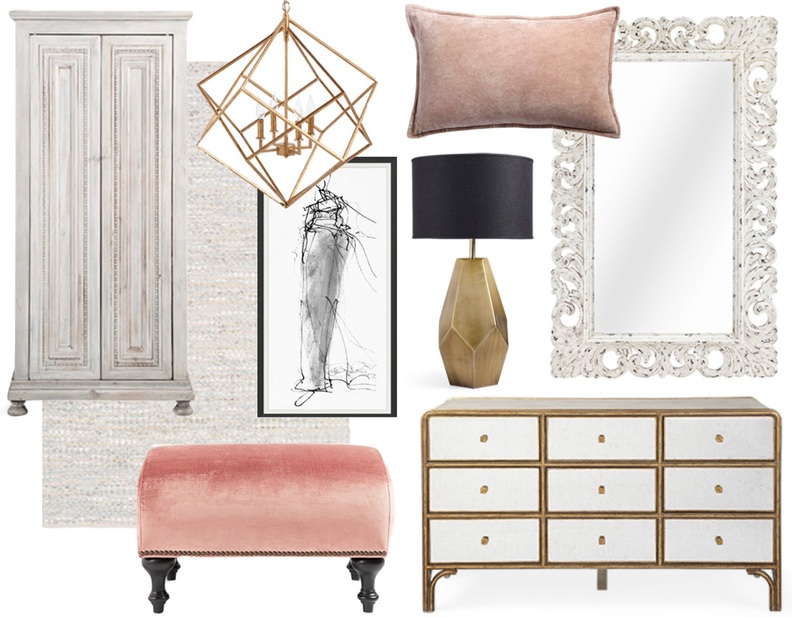 I envisioned pinks, golds and crisp neutrals as part of my space and the pieces at Arhaus really helped me put it all together. My dressing room would be both beautiful and functional and when I found a dresser that could double as a desk, I quickly saw my space start to take shape. I can't wait until the day that this mood board comes to life but until then, I'll enjoy this rendition of my ideal dressing room. Check out their living room furniture page which is currently offering up to 40% off! Yesss darling, I love this selection you have here! Thank Funmi! It's my dream dressing room for sure! Nice one.I think I should make one too.I really would like to have my own dressing room some time soon. I hope to have one for myself one day too! I love the dressing room design and decor choices on your mood board! I had never visited the Arhaus site before but I'm looking at it now - and see that lovely Rachelle Large Cabinet and Fiona Upholstered Ottoman that are in your mood board. I love them! I love that Stone Washed Velvet Rectangle Pillow too. And the mirror. Great store and great dressing room mood board! Oh they have so many amazing pieces! So glad you enjoyed the post. I am loving the pink velvet futon!! Thanks Lorna! I am too! haha ! That would be the ultimate dream right? I can just imagine how glam & luxe your dressing room would be! Love these pieces you’ve picked out. Hopefully you’ll get to put it together with some of these pieces soon! Lovely picks! I like the Ottoman chair, cute color. I think it's my favourite piece in the whole room. Omg you´re the best! Even on vacations you still working hard! Aww thanks for recognizing that Marisa. You are so sweet. I try to be productive but still have a balance spending time with my family. Can definitely be difficult sometimes. I do too! Definitely the color themes in my house currently. I dream of having a dressing room, too, and this decor is simply gorgeous. I love the combination of rose and gold! I love the idea of a dressing room! This is great inspiration for the future. I do too. Hopefully one day! So beautiful! It seems as though we might share the same dream! This is an amazing inspo board..I'm decorating my nursery and I'm hoping it'll look like the kid version of this! Thanks Kim! I can't wait to see how your nursery turns out! Great selections babe!! Love them all! Thanks for sharing! Wow! Nice inspiration and I really love do my own style on my room ^^ And this is so cute to do! Omg! I love these picks! Thanks babe! I do too! Love your selections. Its so important to have a well decorated space to get those creative juices flowing. Thank you for sharing babe!